Pleased to report that we’ve already got 50 likes for the page, so it is getting known in the area. 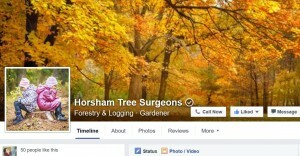 We have made sure to fill in lots of information about Horsham Tree Surgeons and we’ve inserted quite a few pictures. We wanted to have a page that would be attractive and informative. In time we want to get people to click on our website link – or they can even contact us direct from Facebook. There’s a new feature on the page that allows you to put a link right on the photo at the top. We’ve linked it to the phone number, but there are a number of options for the button. You can have it to send a message or an email, watch a video or several other options. Maybe we’ll try out a few to see what gets the most ineraction. We thought we could even link the button to a freebie – like some information about planting trees, or how to recognise some disease. Anything to engage readers and get them to opt i so we can collect their email addresses and more! So we’re gradually tying together the website, Youtube video and the Facebook page. Not sure whether we think Twitter is worthwhile, but I’ll be doing some research before we decide. I think the next stage is to get the CRM up and running and decide the kind of data we want to collect. You can’t ask people for too much information or you put them off, but you want sufficient to be valuable!